Meanwhile, Prof. Folahan Adekola of the Department of Chemistry, University of Ilorin, has warned that dying of hair increases risk of cancer. Adekola also said this during the week, as reported by an online medium. He revealed that hair dye formulations contain chemicals known as Yombo-fitta and Yombo-tumtum, which he said are freely sold in Nigerian markets for people to dye their grey hair and look younger. The expert explained that research had revealed the presence of highly toxic metals such as lead and arsenic and other carcinogenic compound in the dyes. 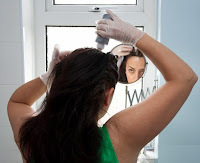 Adekola pointed out that given the widespread use of hair dye products; even a small increase in risk may have a considerable public health impact. “The International Agency for Research on Cancer (IARC) reported that hairdressers and barbers are at increased risks of bladder cancer due to exposure to these chemicals,” he added. The chemists suggested that it was important to therefore eliminate human exposure for sustainable development in the country.